We don’t deviate much from the past when it comes to the DiLaura Christmas morning menu. Since my earliest memories of Santa Claus and pink bikes with baskets, Christmas morning always starts with a buttered slice of my Grandma DiLaura’s toasted panettone. The smell of sweet anise wafting from downstairs is a sign that ‘ole St. Nick has done his job. Our recipe dates back to the late 1800s Florence, where my grandmother’s sister’s mother-in-law was an award-winning baker. Of course the story goes that she never used a recipe and no one has ever been able to make it as good since. While my grandma was smart enough to write down the measurements for this edible heirloom, there were some parts of her recipe that did not get recorded. My grandma had a special heavy wooden chair that lived in the basement 364 days of the year. 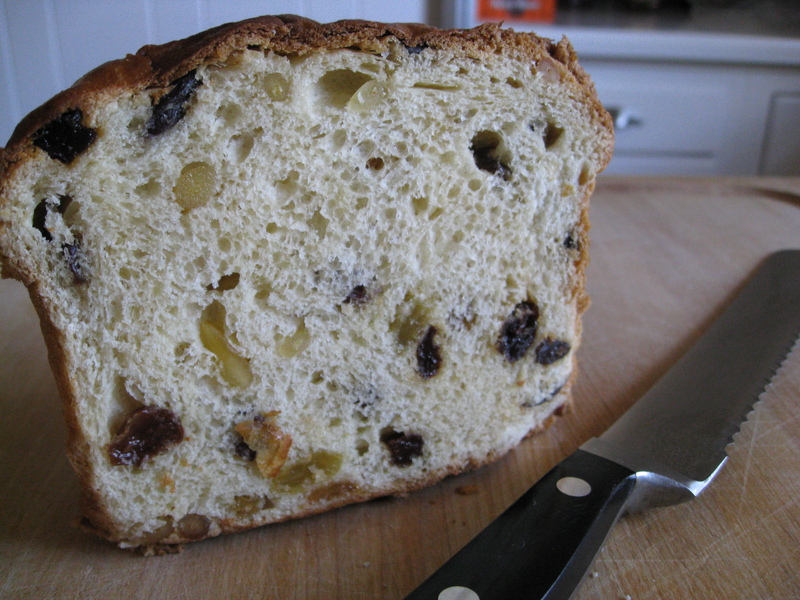 On panettone-making day, the chair was ceremoniously brought up to the kitchen where she placed a huge stockpot atop the seat and got to work mixing all of the ingredients with her special oversized wooden spoon. After my parents married, my mom began helping on the big day and made the mistake of suggesting it might be easier to mix the large batch, of what is quite sticky dough, with her hands. To which my grandma promptly replied, “Oh no, honey you can’t do that, you have to use the spoon.” Deviate she did not. My grandmother has since passed on, but my mom has heroically carried on the tradition of making our annual panettone. Our recipe is different from many you’ll find in stores, which often include candied fruit. 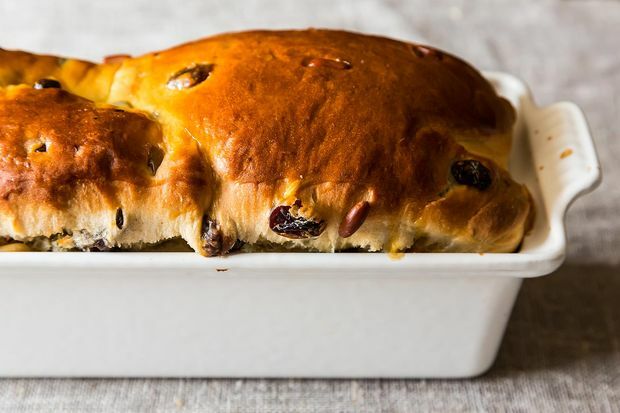 We prefer a mix of dark and golden raisins with pine nuts, but of course you could make it however you prefer. After all, my mom ditched the wooden spoon and has been hand-mixing since taking over the panettone helm. This recipe makes about 16 pounds of bread, which my mom breaks up into four large 2 1/4 pound loaves and four smaller 1 3/4 pound loaves. She gives everyone in the family a loaf and also freezes a few. You could easily cut the recipe in half, but your friends and neighbors will thank you if you don’t! In a medium saucepan, scald milk with 4 cups sugar, stirring often. Then add butter and shortening (or all butter), and melt, stirring often. Remove from the stove and add anise oil or extract to milk/butter/sugar mixture. Let cool slightly. Dissolve yeast and 1/4 cup sugar in enough warm water to cover (1 1/2 to 2 cups) and let double in volume. In a large bowl, mix 5lbs plus 5 cups flour and salt. Add raisins and pine nuts. Add slightly cooled milk to flour mixture. Add eggs and mix together with large wooden spoon. Add yeast mixture and mix well. Grease your hands and mix and knead for about 5 to 10 minutes in the bowl (adding 4 to 5 cups flour as needed). Dough will be very sticky. Grease sides of bowl, cover with greased plastic wrap and several towels, and let dough rise in a warm place for 1 1/2 to 2 hours, until doubled. Grease loaf pans — we use four large (9 5/8 x 5 1/4 x 2 3/4) and four small (8 1/2 x 4 1/2 x 2 5/8). Lightly squeeze to release any air bubbles and shape dough and put in pans. Cover with greased plastic wrap and towels and let rise for 1 1/2 hours. Bake at 350 F for about 20 minutes. If using multiple oven racks, rotate loaves, then lower oven to 325 F and bake for 20-25 minutes, or until top is a medium golden color. After bread is baked, brush tops with egg yolk and water mixture and return to oven for about 5 minutes. What Else Did Grandma Whip Up? Yum! Can’t wait to have some next week! !